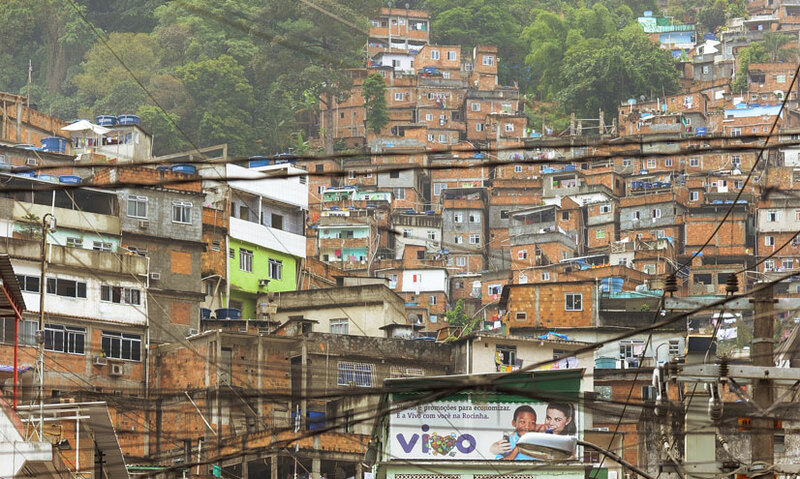 Meet the inhabitants of Rocinha, one of Brazil's biggest slums. How does living in informal housing, with little infrastructure, affect them? Rocinha, in Rio de Janeiro, is Brazil's biggest favela – a slum or informal settlement – and is home to 200,000 people. The conditions in Rocinha are cramped, and a lack of infrastructure, such as sewerage and refuse collection, means that disease spreads quickly. Drugs, guns and gangs are rife in Rocinha, as stressful conditions lead to social instability and poverty. Despite its problems, there is a strong sense of community amongst Rocinha's residents, as they work together to improve facilities and break the cycle of poverty. This is Rio de Janeiro in Brazil. Its sun kissed beaches and luxurious housing, enjoyed by the wealthier inhabitants of Rio, are only a dream for the residents of Rocinha. Rocinha is a favela – also called a slum, or an informal settlement.